Neil McCann will not decide on his future as Dundee manager until after Saturday's final Premiership game of the season. McCann took interim charge of the team with five games remaining and guided them to two wins a draw. Dundee are now safe from relegation but McCann is holding off talks on taking the job permanently. "I need to do my job properly, and that is setting the team up to win games," McCann said. "Afterwards, once the guys go away for a well-earned break, I will sit down with the club." Dundee travel to Hamilton on Saturday, with their hosts needing a win to ensure that Inverness Caledonian Thistle finish the season in bottom place. 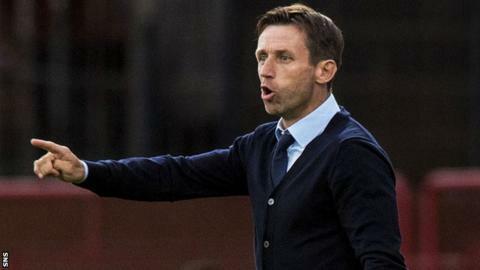 McCann's side lost 2-0 at Inverness on Wednesday night, in his first defeat as manager. The 42-year-old says he has "absolutely loved" his time in charge, and will hold talks with Dundee managing director John Nelms and Sky Sports - who employ McCann as a pundit - before deciding his future. "I had a brief conversation, 20-second stuff, regarding the conversations that will take place after the Hamilton game," McCann said. "I will of course sit down with Sky because Sky have allowed me to come out of a job which I am contracted to do, to come into this one. So I need to oblige that favour and give the honour back to them. I have still got a job to do with Sky at the [Scottish] cup final. "I have absolutely loved the job and I wouldn't disrespect the club or Sky by giving any indication of what way I'm going to go. I need conversations." Dundee were second-bottom when they sacked Paul Hartley after a seven-game losing streak, but McCann managed to turn the team's form around. There was frustration, though, as Inverness raced to a 2-0 lead in the opening 10 minutes at Caledonian Stadium on Wednesday night. "I didn't enjoy the start of the game, I didn't enjoy last night going over in my mind what I could have done differently, what we could have done differently as a group," McCann said. "There were certain things as a manager I learned and certain things as a coach I learned, and I have kicked myself. Maybe I should have done certain things to help the guys. So I will take stock of that. It was a difficult night but I am back in ready to go again."